The rooting aware of political theory from the perspective of the field of Islamic civilization worthy follow-up and attention to the ongoing research, special attention to the process of theorizing has scarce in academia. The concept of political renewal and scientific building science Islamic political, and the relationship between the building science of political Islam, and a reality of contemporary Arab. Also addresses this book to build the concepts of Islamic political, and how to build these concepts. Then addresses the methodology of political renewal and main entrances. 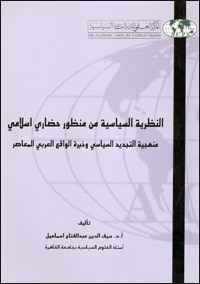 Also studying the concept of legitimacy in the vision Islamic and Arab contemporary relationship to reality. addition to many important topics. This book represents a distinct creative and rarely lacking Researchers Arabs and Arab library in particular.